We had a great time at Science Rendezvous on May 9th, 2015! Science Rendezvous is an annual festival in Canada that takes science out of the lab and onto the street. The University of Toronto is one of the event sites, and SciNet has been part of this event for many years. At the SciNet booth, explorers of all ages found out how researchers use computers for discovery. They saw how even simple computer simulations that you can run in your web browser or laptop can teach them important facts about how complex systems behave. The most popular demonstration seemed to be slingshot, a game where the aim is to fire a laser beam towards a target (spaceship) through a set of black holes that change the beam’s trajectory. Other interactive simulations were a bouncing ball on a vibrating plate, a forest fire web application, and an ecological simulation of rabbits and wolves (the latter two are available at shodor.org). 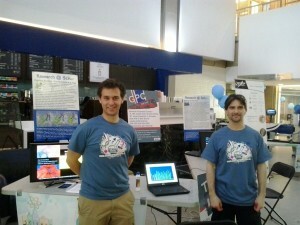 Many thanks to the organizers who made this possible, and to everyone who turned out on a Saturday to discover science!